I'm sure you've heard it before. Weddings are expensive. Because they are so expensive, your wedding budget can be a big stress in the planning process. Whether you're working from a champagne and caviar budget or a penny pinching budget, it doesn't have to be stressful. The key is to be thoughtful and reasonable about your wedding budget from the very beginning and develop a tool for tracking your expenses. I know, I know - with all of the beautiful and sparkly things out there, this can be really hard. Trust me, I splurged a few times for my own wedding that put us over budget ($250 belt... cough, cough...). Here are a few tips to be smarter in your wedding budget planning that will hopefully limit your money stress. Identify what is most important in your wedding. If you and your fiancé agree that looking fabulous in your wedding photos is most important, then you know what to allocate a large portion of your wedding budget towards - dress/tux and photography. On the other hand, knowing what is least important is also good to know in your planning. You can find ways to save money in the budget on these areas. For me, I wasn't interested in spending thousands of dollars on floral centerpieces only for them to be thrown away at the end of the night. Instead, I made paper flowers that were just as beautiful. Do your research. Educate yourself on price ranges for different services in your area so that you aren't going in blindly to conversations with your wedding vendors. Websites like The Knot and Wedding Wire have tools to search local vendors and indications of their price range. This can also help you avoid sticker shock by contacting a vendor that may not fit into your wedding budget. Plan ahead for budget busters. Leave a little room in your wedding budget to account for splurges. There may also be unexpected costs that come up. If you are prepared for them with a set aside contingency fund, you won't be stressed when the time comes to cover those costs. Stay organized. You have a lot of things to keep track of throughout the wedding process. 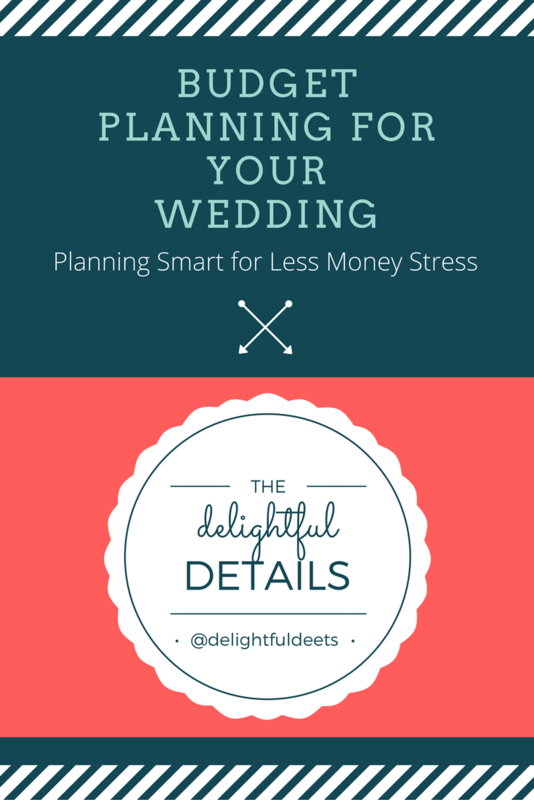 Having a wedding budget template is key to keeping yourself organized. Making sure you know how much money you have to spend, what has been spent already and what you have left is very important to keep you on track. Double check with your vendors to ensure that payments were received and for the correct amount. If you are working with a wedding planner, he/she can help to keep you organized and on budget. But if you're planning solo, then there are a lot of wedding budget templates out there to help with budget planning. What I've found to be very helpful (and FREE!) for the wedding planning process is Google Drive. All you need is a Google account and you can access your documents from anywhere using a mobile device. This can come in handy when you're meeting with vendors or planning on-the-go.I am pleased to share my Wedding Budget Template that tracks your budget of estimated expenses to actual costs based on your vendor payments. Simply subscribe to The Delightful Details and I will share this wonderful tool with you. Enter your name and email in the subscription form at the bottom of this post. Once you subscribe, I will share the Google Sheet Wedding Budget Template document which will get you started in creating a budget for your wedding. You will also receive weekly updates of new posts from The Delightful Details to help you through the rest of the planning process.